Collier County, Florida’s 62nd county, is named for Barron Gift Collier – a pioneering businessman whose vision and personal fortune were tied too much of Southwest Florida’s early growth and development. Born in Memphis, Tennessee in 1873, Collier’s talent and keen eye for opportunity led him into a successful street lighting business and ultimately, into printing and advertising. In just ten years, by the age of 26, he had amassed his first million by selling advertising card franchises to the nation’s booming trolley, train and subway lines. Based in New York City, Collier’s Consolidated Street Railway Advertising Company led the market in mass transit advertising with affiliates in over 70 American cities, Canada and Cuba. By the 1920s his multiple business interests included shipping, motor freight companies, hotels and spas, utilities and newspapers. Remote Southwest Florida first drew Collier’s notice while vacationing with a business partner on Useppa Island off the coast of Fort Myers in 1911. Over the next decade he gradually accumulated over a million acres of sprawling, untouched Florida wilderness – eventually investing millions of dollars more to transform and develop the land. 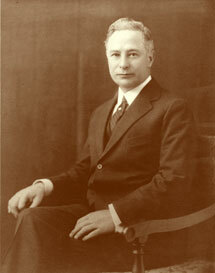 Acting on Collier’s personal pledge to finish the long-awaited highway between Tampa and Miami, the Florida State Legislature created Collier County on May 8, 1923, with Everglades (later Everglades City) as the County seat. By 1928, the Tamiami Trail was completed, along with countless other essential services to bring new economic vitality and home seekers to Florida’s last frontier. A man of tremendous vision and energy, Barron Collier was also instrumental in promoting the national Boy Scout movement. He served as Special Deputy Commissioner for Public Safety in New York City, and is credited with the introduction of white and yellow divider lines on America’s highways. He was decorated by nine foreign governments and was a founding member of INTERPOL, the International World Police. Florida’s largest landholder, Barron Collier died in New York City on March 13, 1939, just ten days before his 66th birthday, and too soon to see his unshakable dream for Collier County fulfilled.